The Gustavus Jazz Lab Band, under the direction of Steve Wright, placed second behind St. Paul’s McNally Smith School of Music in the college and university big band division at the Eau Claire Jazz Festival, Friday, April 3. Also participating in the adjudicated festival were jazz bands from Iowa State, St. Olaf, Hamline, North Central, and U.W. jazz bands from Whitewater, Platteville and Superior. For the competition, each ensemble performed three works for the judges. The jazz band selected works from its recent concert tour program. It opened with Mark Taylor’s Full Count, a work that had been the sight-reading selection at a previous Eau Claire Jazz Festival. The band continued with ‘Round Midnight, written by Thelonious Monk and Cootie Williams, and featuring Jonathan Monk on alto sax. The final selection on the program was Mike Tomaro’s Smoke & Mirrors and featured soloists from throughout the band. The Gustavus Jazz Lab Band kicked-off this semester with a performance at the Minnesota Music Educator’s annual Mid-Winter Conference on February 13 at the Minneapolis Convention Center. The band then opened for The Jazz Knights, West Point’s top jazz ensemble, in concert at Gustavus shortly before leaving on its own eight-concert tour through Minnesota, Wisconsin and Illinois. 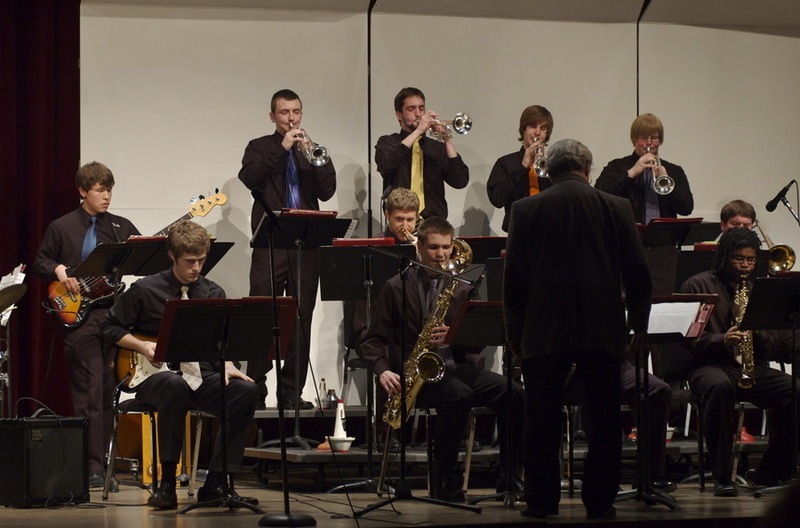 While on tour, the band opened a concert at Chicago’s Fitzgerald’s Jazz Club, fronting for the Chicago Metropolitan Jazz Orchestra, presented clinics and concerts at high schools and churches in three states and provided special music for a worship service at St. Andrew Lutheran Church in Eden Prairie. The Gustavus Jazz Lab Band’s next performance, its Home Tour Concert, is scheduled for Saturday, April 18 at 7:30 p.m. in Jussi Björling Recital Hall and will feature the band’s concert tour repertoire.